Have a dog or cat crate you don’t need? Donate it and help animal welfare groups in Vernon and area! Check out our updated Dog Park Map of Vernon! Available in-store or on our website. Healthy Spot voted WINNER for Best Pet Supply Store in Best of the Okanagan 2018. Just look at that face! Someone will be very lucky to adopt this beautiful young girl! Are you searching for a lovable, energetic, and playful pup? Look no further! 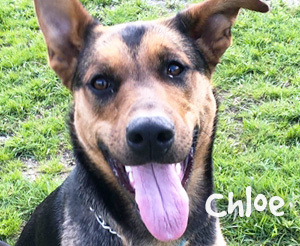 Chloe is a one year old German shepherd mix and is an absolute sweetheart! She loves cuddling and receiving belly rubs, going for long walks in the sunshine, and most of all, following her people friends around all day. Her ideal home would be one where her owner is home most of the time as she does suffer from separation anxiety. She would benefit from basic obedient training to help her make good choices. If you are looking for a loyal gal to spend your days with, stop by the Vernon & District BC SPCAand say hello to Chloe.